Your brand should be a unique expression of your business and its value to your customers. From a design perspective, the visual representation of your brand needs to communicate this in a way that makes you stand out from the pack. In our proposals, we list photography as an out-of-pocket cost, mainly because of how it can fluctuate based on which direction it takes. When it comes to photography, it really boils down to custom photography versus stock photography. The decision to use stock or custom photography often comes down to price and planning. A full-day shoot with a professional photographer comes with more zeros on the bill along with more preparation than purchasing a stock photo online. Looking at the two options on paper often makes it seem like an easy choice: Go stock to save money. However, it’s important to look at the long-term benefits of custom photography for your brand and to keep in mind how poorly placed stock photos might be harmful to your brand. Stock photos are generic. Stock photographers take photos that will sell to the most people. One-of-a-kind photos don’t sell. Generic photos come up in more searches, make the most sales and, therefore, the photo or featured model(s) in the photo start popping up all over the place. Stock photos may seem like a time-saver, but our designers have to search through thousands of images to find those that we feel will best fit the needs of the project. Then, in order to set it apart from all the other people who have purchased this image, we have hours of photo editing to give it the unique look that will fit the concept. This often entails combining an assortment of images together, matching lighting, color, etc., to give it the appearance of a custom photo. Even after a stock photo has been edited to create a unique look and feel, originality is still a factor. Your competitors are in your same industry and are searching for the same subject matter that you are. When using rights-free stock photos, you will see someone else, somewhere, using that image. To manage this problem, you can purchase rights-managed stock photos, which give you some assurance that your competitor can’t use the same image, but these images come at a hefty cost and still aren’t a unique reflection of your business. Your brand is who you are and what you stand for. It should reflect the pride you have in your company and convey its value to your customers. Custom photography is a powerful tool in telling the real story of your business. Showing your employees, your products, your facility, and real interaction gives your audience a personal connection to your brand. Custom photography is exclusive. You can ensure that your competitor isn’t using the same image. By working out the proper licensing agreement with a photographer, your images can be used across the continuum of your marketing materials. Media outlets only use real photos of your company, personnel and products in news and feature articles. They can’t always send a photographer to your company to provide these, and will often ask if you can supply your own. Having a photo library of executive headshots, production photos, facility shots and photos of your staff in action increases your likelihood of being included in newspapers, business journals, blogs and other media outlets, and they add impact to presentations and pitches about your company. The key to successful branding is consistency. Your customers expect a consistent level of quality from you, and your brand needs to portray that. By shooting custom photography, it allows control over the consistency of the photos that are the face of your company. Throughout all your marketing materials, consistent style, lighting, angle and composition all go into conveying the level of professionalism that reflects you and your business. Thanks for the post, Ben. 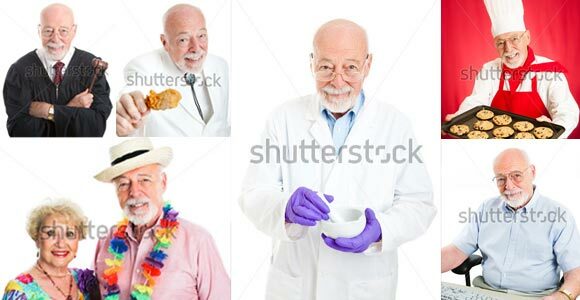 Question – how many stock photos do you think exist today? Hard to quantify? How about within SCORR’s library only? Couple that number with the fact that consumers see thousands of ads a day (Google serves 30 Billion impressions a day between display and search), and I’d suggest that it may not matter which type of photography companies use. As long as it’s relevant and perhaps personalized, a good photo should resonate. I 100% agree that the key is consistency, building a brand image around both intangible and tangible themes that aggregate towards brand recall and share of mind. I agree that the number of stock images out there is enormous, but narrow that search into a specific industry with very specific services, and your chances of overlapping with a competitor grow greatly. We use stock photos in many instances, and pride ourselves in our ability to use them as a building block along with color, typography, messaging, and the melding of other elements to build a story. However, even if you’re telling a compelling story to your clients, if they recognize a face or setting they’ve seen somewhere else, your story is compromised. I’m not saying your story is negated, but the only way you can tell a completely unique story is by building that story with elements that are uniquely you.